Hastings Mbewe has been an inspiration to many in his area. Now he wants to expand his well digging business. He appreciates the fact that Jacana wants to guide him in this process. 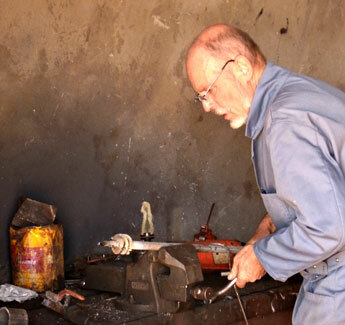 SMARTech advisor Henk Holtslag is willing to train him in manual borehole drilling and installation of rope pumps. 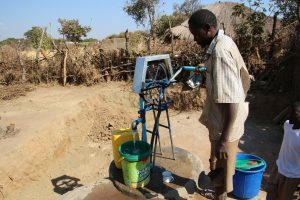 Moses and Hastings drilled three boreholes in Southern Province, at Rangoon Island in Kafue river. 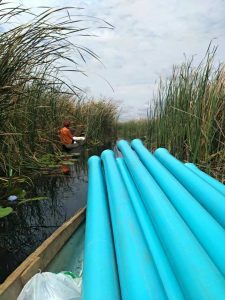 They had to transport all the materials by a small boot to the Island. 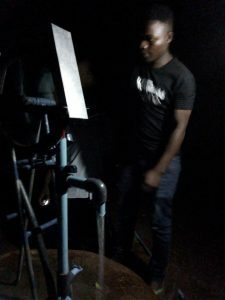 The pumps produced by Gideon Phiri and Joseph Kabwe. 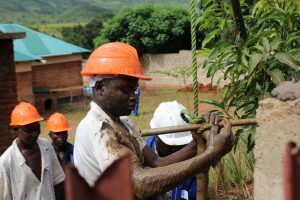 Hasting was guiding the four new drillers from Khova ward, Erasmus, Obuloni, Andrew and Francisco. 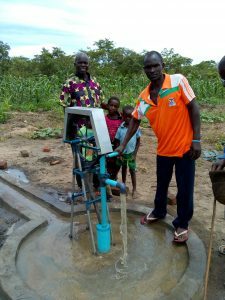 He guided the drilling of two boreholes at the houses of Erasmus and Obuloni. These pumps will be used for household use, but also for marketing purposes. Hastings was selected together with Osward and Moses to be assistant trainers during the drillers training of 6 new drillers. 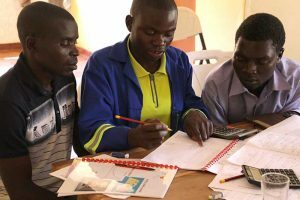 The trainers were Labana Kaduma from Tanzania and Elias Musumala from Malawi (CCAP SMART centre). Hastings performed very well as an assistant trainer. He is calm, can listen very well and explain to the participant how to solve problems. 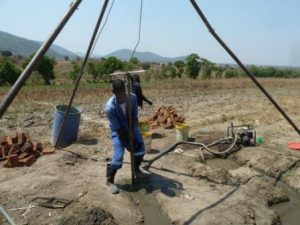 Hastings and Steven drilled a private borehole for a customer in Mfuwe. The pump was produced by George Chulu. 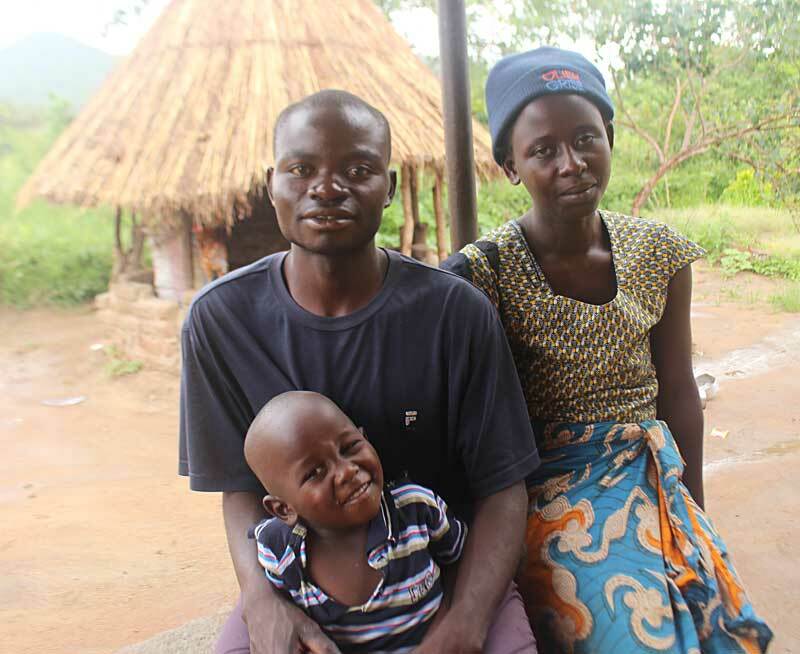 Hastings and Steven got a private customer from Katete which is about 86 kilometers from Chipata. 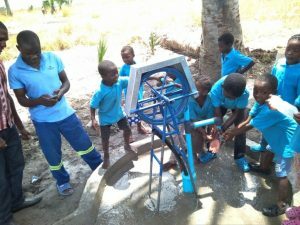 They went for almost two weeks and where able to put a smile on the face of Mr Moses Zulu their customer with a borehole. Pump in Katete at Moses. 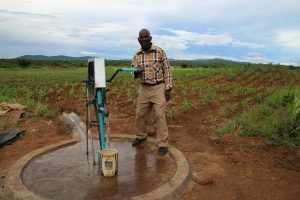 Hastings Mbewe and Steven Zulu made a new borehole on top of the hill near to the house and far from the toilet from farmer Stephen Tembo. 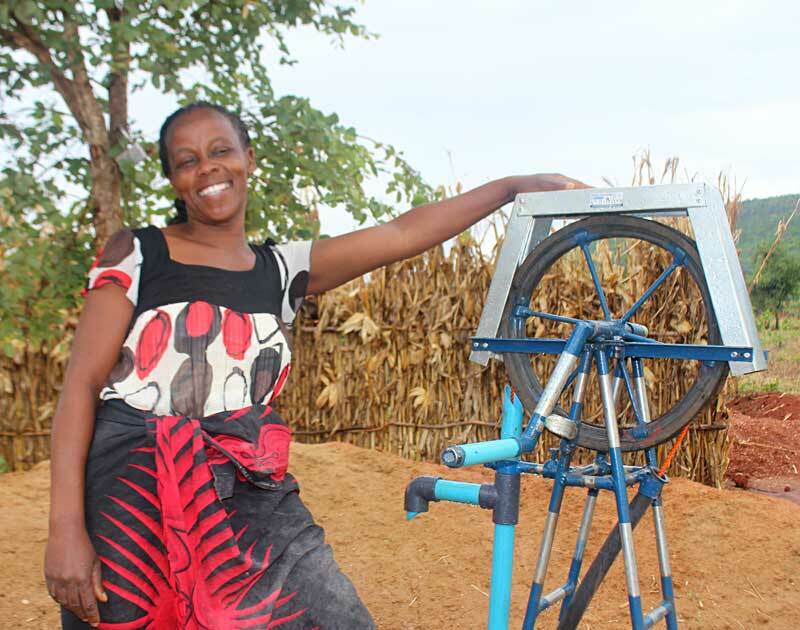 Mrs. Tembo has difficulties walking and is very happy with this new water source. Also the neighbours use the water. Since the pump is on top of the hill, is easy to irrigate his garden which is downhill. 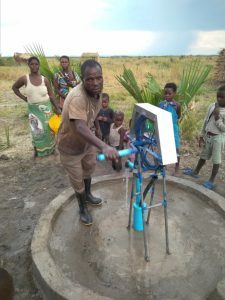 The pump was made by George Chulu. Good work men! 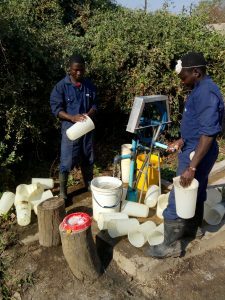 Hastings Mbewe and Steven Zulu had to work during the night to complete the pump installation at beekeeper Bandson Tembo. Reason for that was that one of the pipes had a slightly different dimension and had to be changed in town. But in the end everybody was happy and there was a lot of clean water. 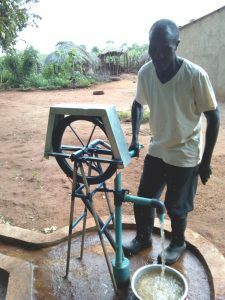 George Chulu made the pump. 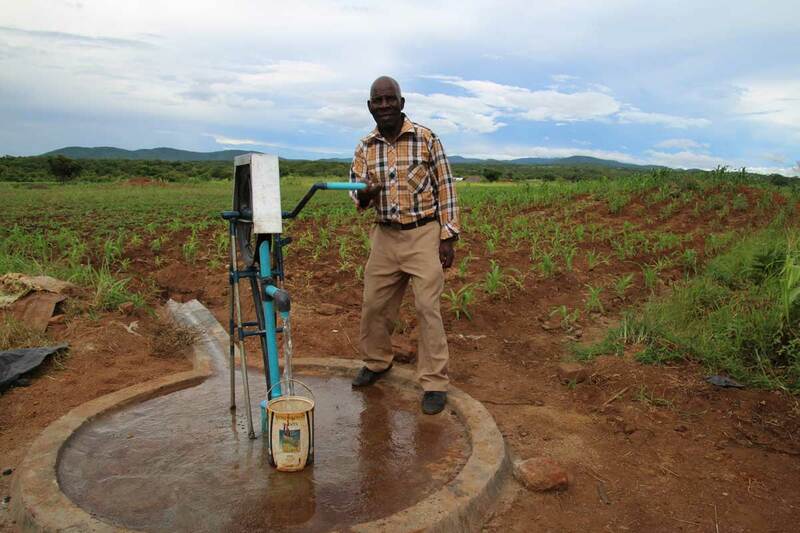 Hastings Mbewe and Steven Zulu installed a pump at farmer Elina Zulu. They also made a ground water recharge system for her. It will catch a lot of water this raining season. The pump was made by Moses Banda. Hastings and Reuben made a tank at farmer James Mbewe. Now when the community gets free water, they automatically also put a bucket of water in James his tank ready for irrigation. 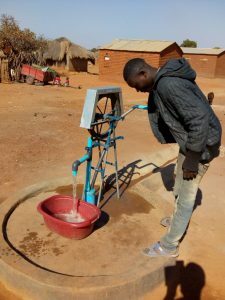 This way, there is no complex payment system needed for the water. 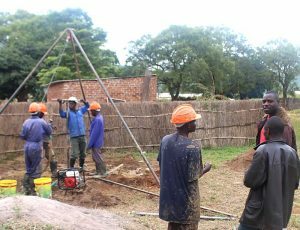 Hastings and Steven successfully drilled a borehole at Kelvin Magawa‘s garden.The borehole has enough water for the garden, nearby villages and the farmers next to kelvin. This borehole never dries up and has continued to give plenty of water for his garden. Hasting and his team faced some problems as a group. Jacana proposed to have every week a weekly planning meeting. This is very helpful for the group. Also a bookkeeping system is introduced to Steven and his team. There is no longer confusion about money needed for materials, back up money and salaries. Everybody registers his hours worked and according to that they get paid. Steven showed himself as a great leader of the team. 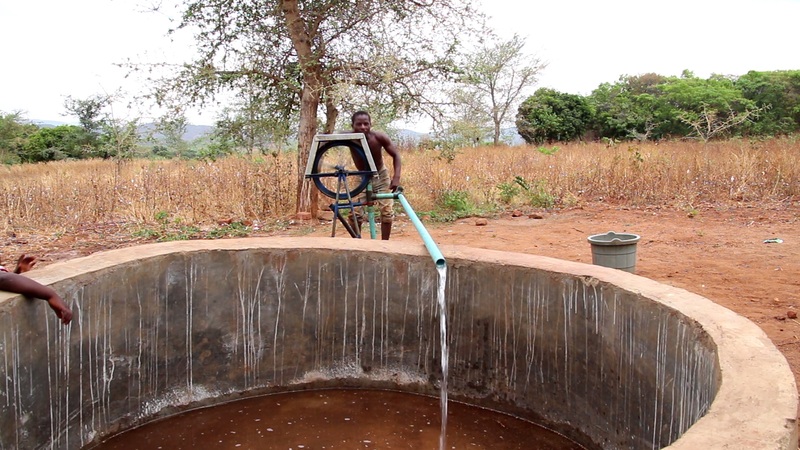 The well of Thomas Phiri was deepened by Hastings and Steven. In this well they could not use the Mzuzu drilling method because the soil structure at the bottom of the well was very rocky. Steven and Hastings had to climb inside with a hammer and chisel to deepen it. After that they installed the pump. The clean water was very welcomed by Thomas his wife and the neighbors. Hasting worked as electrician these month, wiring a house. 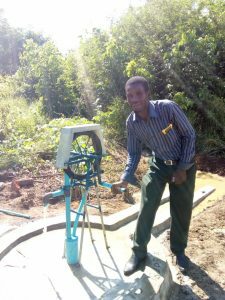 Hastings drilled 4 boreholes and installed rope pumps this month together with his colleagues. One of them was at his own house. Hastings was part of the team who drilled at Steven’s place. They drilled manually up to 23 meters. 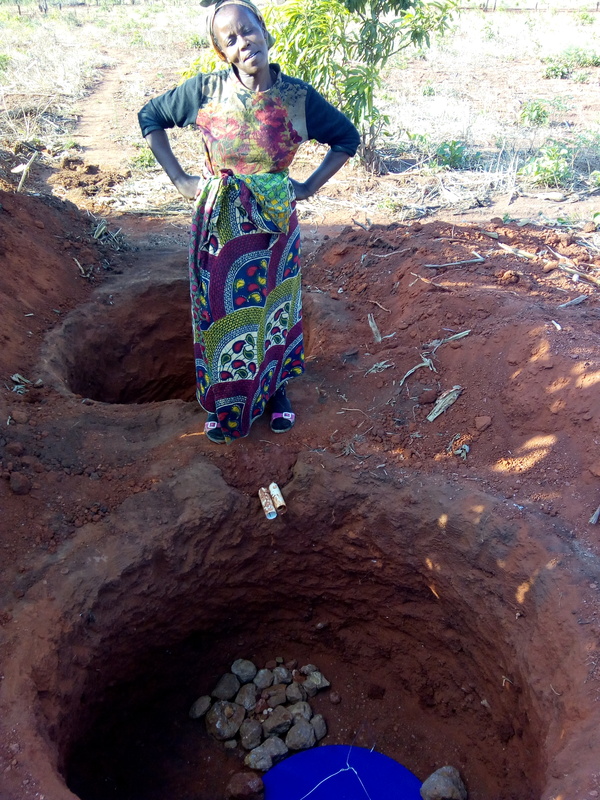 Hastings Mbewe a Well digger in Luangeni Village has been in this business for 4 years. Hastings Mbewe started the well digging business immediately after completing his secondary school. Later he did a course in electricity and computer hardware maintenance. At the moment his passion is “well digging” though at time he repairs electrical appliances and computer hardware right in his village. He is married with one child. Hastings attended the Jacana basic training for three days and after that in March 2017 the technical training. 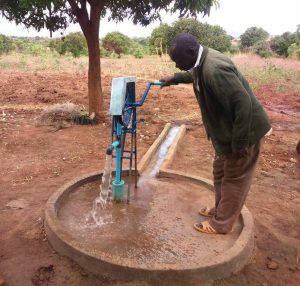 Schools do not have enough resources to install and maintain expensive boreholes. 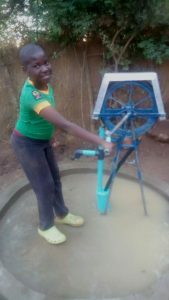 The schools cannot find boreholes that are easy to pump water by the children. 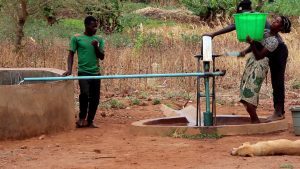 Install affordable rope pump on manual drilled borehole. Install pumps that produce clean water and are easily handled by anyone. Affordable and durable pumps in stock. Experienced worker and spare parts available. Easy to pump by anyone and gives out clean water always. The schools in my area. Increase in demand and orders and every time new faces are coming. Phone call, business card, Facebook, word of mouth. I assume that schools will like my manually drilled bore holes and that they want to buy them in the future. I will install one at my house and ask two schools to come GO: If 1 out of 2 schools says yes then I GO. and see and ask them if they want one at their premises. 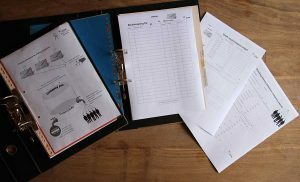 Guidance in book keeping and financial management. A borehole and pump was donated by Castricum helpt Muttathara.